Bet365 is known all over for its internet gambling. The company has recently made several changes on their poker site that have taken into account the evolving technology in the industry and player needs. They have improved their mobile application and introduced a new welcome package. With the changes in place, Bet365 are looking at making their site accessible and suitable for a larger demographic of players in poker. The application was launched in September 2013. This is the app that has been tweaked to meet these new demands. There have been several technical improvements to speed up the loading times and make navigation better and easy. The application has been made available for iPhone, Android and iPad users. For players who make use of the app they will gain access to bet365’s premium poker tables. When playing from your mobile device, you will not notice major differences; your play on mobile will count towards the unique VIP scheme. Bet365 poker has a new welcome package that went into effect on January 6th, 2015. 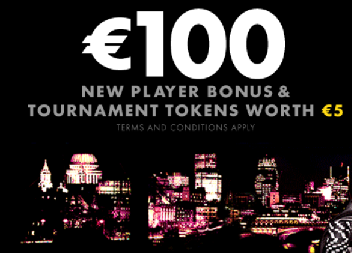 The offer gives you the chance to get up to €100 in bonus money. The aim for the promotion is to earn players early moments of success and encourage them to play more. For players who make deposits, they will as well, have 5 in tournament tokens which are valid for use in the various poker tournaments at Bet365. These include Twister and Sit N Go’s. There is the boost bonus which you can use to make your bankroll better and bigger. All you need to do is top up your account regularly. When you make a deposit of $50 and more, use the code BOOST and you will be in a position to get 25% bonus worth as much as $500. For poker enthusiasts, there is the €100,000 big Sunday bonus. As I mentioned earlier, you will have 20 tournament tokens on the welcome bonus. Winners on each event will qualify for an upcoming €100,000 Big Sunday tournament where also the next 25 finishers will get a second chance to qualify in a satellite that will guarantee another 10 seats. When redeeming any of these bonuses, you need to make sure that you read through the terms and conditions to the letter. If things are not clear, contact the support team for assistance. Bet365 do not only concentrate on poker gaming alone, they have a wide array of internet gambling, which include sports betting, casino games and live dealer games. They are known to have some of the biggest tournaments which involve players from all over the world and offer huge amounts of prizes. You need not worry about fairness while at Bet365, they use state of the art technology to make everything random. This is the Random Number Generator Technology which is audited and certified by TST. The all Bet365 platforms are licensed and regulated by the Government of Gibraltar.